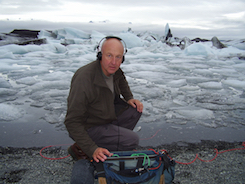 Watson has made a peripatetic and enviable career for himself as a sound technician for radio and television (he earned a British Academy of Film and Television Arts award for his work on the BBC’s The Sound of Birds), pursuing and recording the natural world’s siren calls. 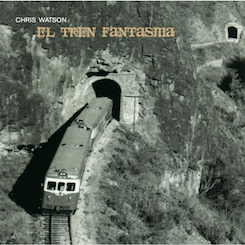 From the Rolls-Royce-like purr of a lounging cheetah to the deep groans of an Icelandic glacier following its inexorable 10,000-year-old course to the Atlantic or the literally visceral snap of vultures cracking through the rib bones of a zebra carcass, the sounds one hears on Watson’s solo releases (all on the Touch label) are a far cry from the ubiquitous whale song CDs that clog Amoeba Music’s new age bins. Stunning in their clarity, Watson’s recordings are often beautiful and at times frightening. But more often than not, despite their natural provenance, they are simply otherworldly. “It never fails to astonish me, the connection between the wild sounds of animals and what we hear as music,” Watson says, reflecting on our impulse to immediately draw aural associations. “These sounds have the power to connect straight to the imagination in the same way that a piece of music may evoke certain images.” Watson’s first experiments with sourcing the “musical” from his surrounding environment were in early industrial groups such as Cabaret Voltaire and Clock DVA, whose gritty samples and martial rhythms held up an acoustic mirror to the grimness of life in Margaret Thatcher–era Britain. Watson’s latest full-length, last year’s Storm, is also perhaps his most musical — at least compositionally speaking. 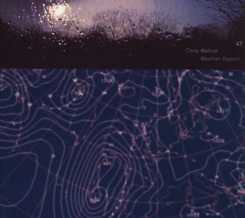 A carefully edited three-part suite of field recordings, Storm traces a series of particularly aggressive weather… systems that hit the northeast of England and Scandinavia in 2000. Watson recorded the storm’s early rumblings — with the lonesome bellow of seals as accompaniment. Meanwhile, longtime collaborator B.J. Nilsen — who has released his own subtly processed, environmentally sourced ambient recordings under the name Hazard — caught what Watson calls “its last breaths” as it descended into the Baltic Sea. “We were really fortunate to have a sort of narrative already there for us to work with,” Watson says. “Of course, we couldn’t record the storm as it was crossing over to Europe, so the middle track is a sort of conjecture of what it sounded like, a combination of [Nilsen] and my recordings.” The two have been experimenting with translating the album into a live piece, a version of which will be presented, sans Nilson, as part of Watson’s performance at Recombinant Media Labs on Nov 30. Reflecting on past performances of the piece, Watson remarks that he is continually surprised by how audiences react: “It literally has a powerful, moving effect on people. People have said to me that they put their coats back on because they were cold or found themselves shivering.” Certainly, many more of us have heard if not experienced a powerful storm than could identify a recording of or have witnessed firsthand, say, giant sea turtles mating. I jokingly ask Watson if he has ever visited the Tonga Room, the famed Polynesian-themed bar in the basement of the Fairmont Hotel, in which a tropical storm lets loose at 20-minute intervals over an indoor grotto. He laughs at the idea of the place and says that, regrettably, he hasn’t been. “But wouldn’t that be an amazing venue in which to perform Storm?” he suggests excitedly. The Fairmont’s guests would never know what hit them.